If nasal obstruction is caused by anatomical, structural changes (e.g., nasal septum deviation), minimally invasive septoplasty can be necessary after unsuccessful conservative (non-surgical) treatment. This surgical procedure aims to correct the deviated nasal septum to make a satisfying and sufficient nasal breathing possible and to get rid of other symptoms of nasal obstruction. In contrast to other surgery options, we try to damage the tissue inside the nose as less as possible during minimally invasive septoplasty so that the recovery period will be shorter. Thus, nasal tamponades will not be necessary. How is minimally invasive septoplasty carried out? Every surgery on the inner or outer nose is undergone under general anesthesia at Beta Klinik. Minimally invasive septoplasty takes about 30 minutes on average. Surgery on the outer nose will take longer subject to the severity of the disorder. At the end of septoplasty, splints are placed in the nose to stabilize the nasal septum. They do not cause any pain but enable you to breath after surgery. Bleedings during minimally invasive septoplasty are extremely rare. Because minimally invasive septoplasty is very gentle, you only have to stay one night at our ward. It does not leave any facial swellings or bruises so that you can easily attend social events. Even pain is are, but there can be a sensation of pressure in the head. It is possible to take a flight 4 days after minimally invasive septoplasty. You will be discharged from our clinic one day after surgery. Follow-up examinations are necessary every day in the first week and every 2-3 days in the second week after minimally invasive septoplasty. Those can be, of course, also carried out by a colleague in your direct vicinity (also abroad). 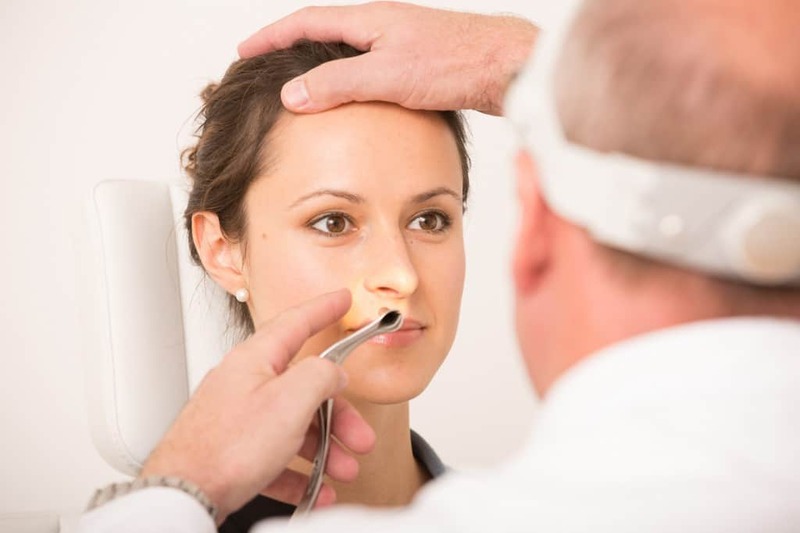 You can generally resume work one week after minimally invasive septoplasty. However, it depends on your occupation and may vary individually. You can resume moderate sports activities (e.g., riding a bike, hiking, moderate jogging) two weeks after minimally invasive septoplasty. Team sports like soccer, basketball or similar are possible after 6 weeks. But the sports activity of your choice should be, of course, discussed with your physician before you resume it.